Glutamine is an essential amino acid needed by your body in large amounts. It is actually the most common amino acid found in your muscles – over 61% of skeletal muscle is Glutamine. However, its blood levels can decrease during intense training, or due to major injuries, burns or surgeries. In those cases your body requires more glutamine than the amount supplied by a normal diet. That leads your body to break down its protein reserves stored in your muscle and use that for energy rather than carbohydrates. Additionally, the function of your immune system can be compromised when insufficient amounts of glutamine are available. 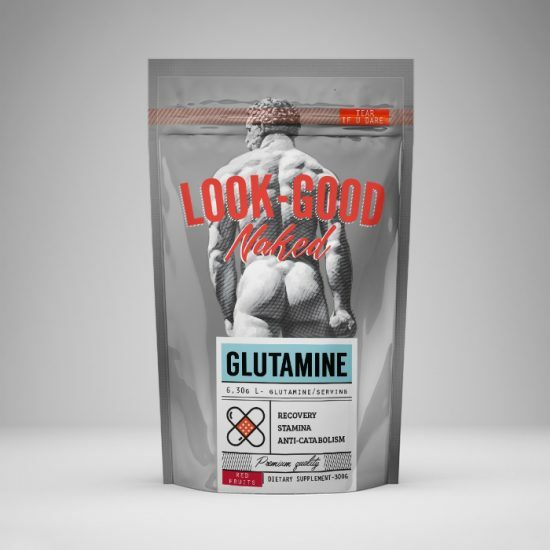 So, Drinking Look Good Naked s Glutamine before an intense training will allow your body to use the glutamine in the muscles to synthesize protein and build new muscle mass. Glutamine also improves muscle hydration, which aids the muscle recovery process and reduces recovery time and soreness after training. That is the reason that L-Glutamine is a ‘must have’ supplement for post-workout use, for those involved in intense training & exercise. Moreover, research evidence indicate that HGH (Human Growth Hormone) levels are up by nearly 400 percent after supplementing with L-glutamine. This hormonal response aids with fat metabolism and could help in weight loss and building lean muscle mass. Add to this that Glutamine helps to support a balanced insulin response and keeps blood sugar levels stable, throughout the day, and you have a powerful aid in supporting and maintaining healthy fat loss. So, whether trying to pack on muscle, improve recovery, increase your performance or burn off fat, glutamine is going to support you all the way to your goal. We recommend 1- 2 servings daily. Add 1serving (=1 scoop) to 200ml of water or fruit juice, shake and consume. Ideally you should consume 1 serving immediately after workout and you should take the second serving 20 minutes before you go to bed at night, to maximize recovery during sleep.